How do we Know that Jesus was Real? "This is the disciple who is bearing witness about these things, and who has written these things, and we know that his testimony is true." When Jesus lived, lots of people followed him around, listened to him talk, and saw the things he did. After Jesus went away, the same people talked about him and shared his words and stories, and those stories were soon written down. After the stories were written down, many people read the stories, and made copies so that the stories would never go away. We still have these real stories about Jesus, and we can even find very old copies of the stories, so we know they have not changed. We can look back a long time, and it is easy to tell that these are real stories from real people who saw the real Jesus. There are so many reasons we know that the stories written in the Bible about Jesus are accurate and true. One reason we know they are true is that we have four books about Jesus, Matthew, Mark, Luke and John. Even though these books were written by different people, they talk about the same things and they support each other in the details. A lot of the details also show that these stories were written close to the same time that Jesus lived. 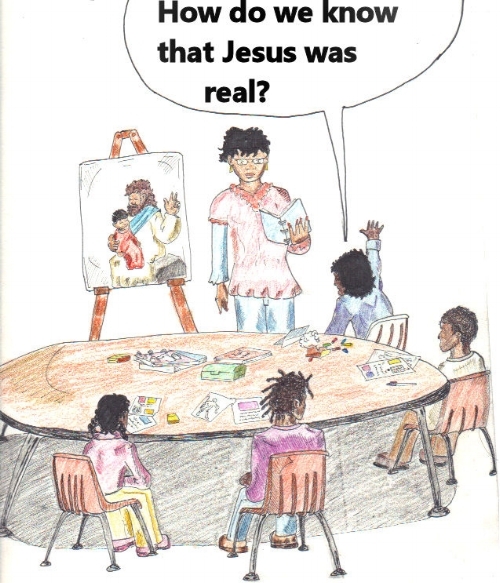 If your parents or grandparents are able to tell you stories about when they were your age, that is about how old the eyewitnesses were when they wrote down the stories about Jesus. And just like your parents really remember being kids, these eyewitnesses really remember what happened to Jesus. We also have very early copies of these stories, and even though there are many copies, the stories have not changed over the years. There are even stories about Jesus that aren’t in the Bible written by people who weren’t followers of Jesus, but they still knew about Jesus. There is more evidence that Jesus was real than that Alexander the Great was real, or that Caesar Augustus was real. But people still believe in Alexander and Caesar, and you can believe in Jesus. The arguments for a historical Jesus are so numerous, that there are whole libraries of books written about them. Most of these arguments come from the accuracy of the Gospels, because most of what we know about Jesus was written in the Gospels, although there are some extra-biblical sources that talk about Jesus, as well. These include the Jewish historian Josephus (37-100AD), the Roman historian Sextus Julius Africanus (160-240AD), Tacitus (56-117AD), Mara Bar-Serapion (70-?AD), Plegon (80-140AD), and even the Jewish Talmud. We can be reasonably certain that the documents were authored close to the time of Jesus. We know from archeology of graves from the time of Jesus that the names of people in the Bible were common names from that period of time. The historical rulers, events, and geography used in the Bible are accurate to the time period. Another way we know these were written early is what they don’t say. None of the books mention the very, very major event from 70 AD: the destruction of the Jewish temple by Rome. So it’s fairly certain these books were written before 70 AD. Keep in mind that Jesus died around 33 AD, so that’s a 40-year area in which they may have been written. They also don’t mention the death of Peter, Paul or Jesus brother James. And we know about these events because they were recorded by other historians of the time. One reason is that Jesus predicted the destruction of the temple, and writers, especially Matthew, were very interested in pointing out when and how Jesus’ prophecies came true later on. Another reason is that the author of Acts is the same author who wrote Luke, and he wrote his Gospel before the book of Acts. Since Acts is the record of the early church, this author would absolutely have recorded the death of the apostles. The fact that he didn’t tells us that he wrote his Gospel before these guys died in the 60’s AD. That’s less than 30 years later. Also, Paul – who wrote around 60 AD – actually quotes Luke’s Gospel a few times. So we know that the Gospels were written close to the time of Jesus. We also know that they are consistent. There are not a wide variety of Christ legends from the first century. Simply the four Gospels which all harmonize in the important details. There are no counter traditions that contradict the Gospels on any major points such as how and where Jesus lived, ministered, died and rose. There are no counter Gospels that set the story in other places, or contradict the core theology, or change any of the major characters. Jesus is consistently surrounded by 12 core disciples, and three close disciples. He always dies in Jerusalem at the hands of the Romans through the machinations of the religious leaders of Israel and is resurrected three days later, etc. There is a lot of evidence that the authors of the Gospels have access to eyewitness accounts. For instance many early church writers mention that Matthew wrote a gospel for the Jews, every single copy of the Matthew manuscript attributes the book to Matthew, the author of the book appears to be Jewish by his concern with prophecy, his familiarity with the Jewish Law, customs, history, language, and with his concern of the evangelism of the Jewish people, the author of the book makes more intimate and humble references to Matthew, the disciple, the author is more concerned with numerology and with money than any other Gospel writer, and Matthew orders his book thematically. Church Fathers credit Mark as writing his Gospel from the teaching of Peter and the book of Mark is disorganized – which makes it more likely to be a collection of stories gathered from an eyewitness. The author of Luke claims not to be an eyewitness, but claims to have access to eyewitness accounts. Much of Luke is copied from Matthew and Mark, which seem to be eyewitness accounts. Luke includes a great deal of unique information for the perspective of Mary, indicating he had access to Mary’s testimony. And the intention of Luke’s author appears to be taking existing accounts and organizing them chronologically. The author of John does not call the disciple John by name. Instead he calls him “The disciple that Jesus loved.” Very early Christian Writers claim that John was much younger than the other Apostles, probably just a teenager when he followed Jesus, lived well into his 90’s and did most of his writing late in life. There is actually a direct historical chain of evidence for John’s gospel. One of John’s disciples was named Polycarp. One of Polycarp’s disciples was a man named Irenaeus. We have early copies of all of Irenaeus’ writings, and he directly attribute’s John’s gospel to the disciple John. Establishing that the Gospels were built on eyewitness accounts, we can now look at the current copies of the Gospels. Many critics will claim that our copies of the Gospels come from so many centuries of copying that they are full of errors. The fact of the matter is that we have so many copies of the Gospels from so many places where they were passed all over the world and that many of them are very, very early copies. The fact of the matter is that if we compare all of the copies from all of the time periods from all parts of the world, they are all basically the same. This means that there is a lot of accuracy in the copies made over the years. There is a lot more evidence for Jesus’ life than this, and it is well worth looking into. But there is enough evidence that even very skeptical scholars will admit that Jesus was a real person, and that some of his followers definitely thought he rose from the dead (even if these scholars don’t believe that he really did).